Two main approaches are used in order to detect the sentiment polarity from reviews. The supervised methods apply machine learning algorithms when training data are provided and the unsupervised methods are usually applied when linguistic resources are available and training data are not provided. Each one of them has its own advantages and disadvantages and for this reason we propose the use of meta-classifiers that combine both of them in order to classify the polarity of reviews. Firstly, the non-English corpus is translated to English with the aim of taking advantage of English linguistic resources. Then, it is generated two machine learning models over the two corpora (original and translated), and an unsupervised technique is only applied to the translated version. Finally, the three models are combined with a voting algorithm. 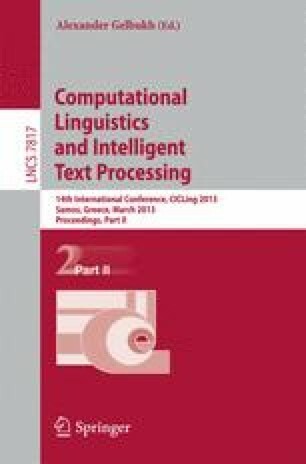 Several experiments have been carried out using Spanish and Arabic corpora showing that the proposed combination approach achieves better results than those obtained by using the methods separately.